Klaas Jan Huntelaar scored an injury-time penalty to send the Netherlands into the quarter-finals of the World Cup with a hard-fought 2-1 win over Mexico in the second round on Sunday. Arjen Robben was adjudged to have been tripped in the area by Rafa Marquez in the injury time and Huntelaar coolly placed a brilliant penalty into the bottom-left corner to knock Mexico out of the tournament. However, it was Wesley Sneijder who rescued the 2010 runners-up, in the 88th minute, bringing up the equaliser, cancelling out the 48th minute brilliant goal by Giovani Dos Santos which had put Mexico ahead. Mexicans had dominated the match and looked destined to reach their first quarter-finals since 1986 but Sneijder's effort two minutes from time and Huntelaar's penalty in added time crushed their dreams. Playing in the knockout stages for a sixth straight World Cup, Mexico dominated the proceedings right from the start and had four shots at the target in the first half itself but none of them enough to put them ahead. Herrera came close early on after being fed by Peralta but his effort went wide of the bottom-left post, while a long shot by Salcido was easily parried away by Cillessen. Holland, who struggled to keep possession early on, got a decent chance in the 28th minute when skipper Robin Van Persie, who is returning into the team after a suspension, brought a lofted ball down in the penalty area but he failed to connect properly as his right-footed effort went wide. Mexico tested the Dutch backline once again in the next minute when Santos played a pass into Peralta, who received the ball and fired it at Cillessen from 25 yards. In the 42nd minute, Mexico had another opportunity when Santos raced into the rival box and found Andres Guardado's pass but his acute angle shot was blocked by Cillessen. In the stoppage time, Holland got a rare chance when Van Persie pounced on the ball after a lapse by the Marquez and raced towards the penalty area with Arjen Robben in support but the Bayern Munich winger played it late. Robben went down to the ground due to the combination of Moreno and Marquez crashing into him but in the process Moreno injured himself and had to be carried off on a stretcher as the first half came to an end. After the breather, Santos put Mexico ahead when he pounced into a bouncing ball, controlled it on his chest and sent it across a diving Cillessen with a brilliant left-footer from 30 yards. Pushed on the backfoot, Holland tried to put pressure on their rival but they were unable to take advantage of the set pieces. In the 57th minute, Robben whipped in a ferocious corner from the right and De Vrij guided it towards the goal, but Mexico goalkeeper Guillermo Ochoa came up with a fantastic save. Four minutes later, Sneijder came close when he was fed by Robben at the edge of the box but the midfielder's shot went wide after a deflection. Ochoa came up with another wonderful save in the 73rd minute when he staved off Robben's decent shot from an acute angle. Ten minutes later, Ochoa was again in action when he blocked a Huntelaar shot from point-blank range. However, it turned out to be offside. Sneijder finally brought up the much-needed equaliser for Netherlands in the 88th minute when he unleashed a half-volley into the bottom-left corner of the goalpost after getting a header from Huntelaar, who had come in for skipper van Persiemidway in the second half. Lady luck too smiled on Netherland after that as they were awarded a penalty after Robben was brought down inside the penalty area by Marquez in the injury time. 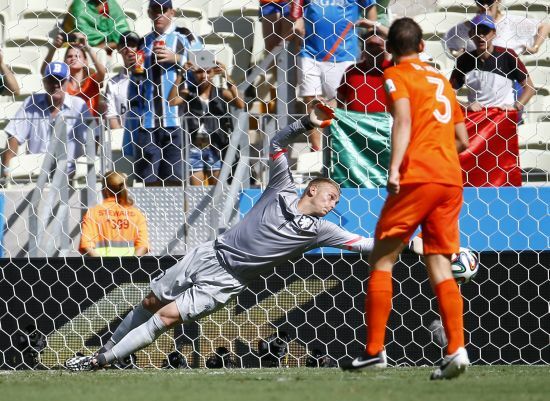 Huntelaar coolly converted the penalty sending the ball into the bottom-left corner as Mexico suffered a heartbreak. Mexico's best ever showing at a World Cup was when they reached the last eight on home soil in 1970 and 1986.